There must be something in the original plumbing and plaster at the Riviera Hotel that’s keeping its entertainment legacy alive and thriving. Or perhaps it’s the energy of some of the former owners/shareholders that include Harpo and Gummo Marx and Dean Martin. The Riv was once the headline-home to Liberace, Splash, and in 2009, An Evening at La Cage (featuring female impersonators including Frank Marino) ended one of the longest runs in Strip history. Famed opera tenor Luciano Pavarotti performed to a sold out audience at the Riv convention center in 1984. Not so with the Riviera Hotel and Casino. The nearly 60-year old legendary hotel resort and casino is offering a variety of shows this spring that not only bring back heyday memories: there is also a contemporary male striptease show and a parody of the History Channel’s hit reality show, Pawn Stars, on the roster. 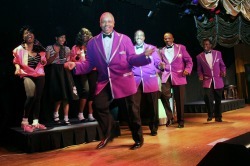 Forever Motor City: Directed by Broadway veteran Gary Kupper and featuring a cast of talented entertainers and former members of legendary Motown musical groups including The Spinners, The Main Ingredient and The Marvelettes, Forever Motor City features hit songs by American icons Marvin Gaye, Smokey Robinson, The Temptations, The Supremes, Stevie Wonder, Lionel Richie, and The Four Tops.Motown songs performed by the stellar cast include:“For Once in My Life,” “My Girl,” “Sugar Pie Honey Bunch,” “I Heard It Through The Grapevine,” “Pride and Joy,” and “Stop In The Name of Love,” along with many others. Men the Experience: In Vegas to celebrate a bachelorette party, birthday party, divorce party or just a wild ladies night out? Men the Experience boasts a shirtless cast that could have just walked out of one of your favorite romance novels. These athletic men showcase creative choreography and elaborate costumes (or lack thereof) and guests are encouraged to participate on stage throughout the show. Be it gangsters or cowboys there is enough muscle and innuendo on stage to keep every woman in the audience entertained and wriggling in their seat. Pawn Shop Live! : Based on the story of the world famous pawnshop, Gold & Silver Pawn, this production includes story contributions from Rick Harrison and the Harrison family.Produced by Emmy® award-winning producer Derek Stonebarger and co-written and directed by Troy Heard, PAWN SHOP LIVE! features seven live actors and dancers, as well as a puppet, celebrity guests and surprises: even the real “Pawn Stars” will appear on stage as often as their filming schedule permits.